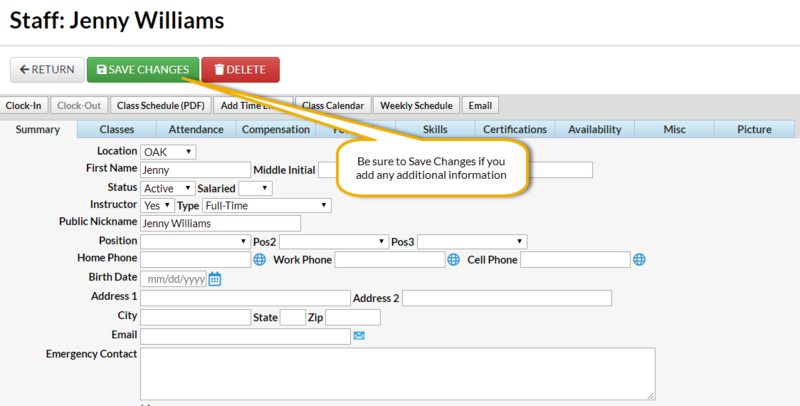 Adding staff / instructors to your database will allow you to assign instructors to classes as well as allow staff to check in and out with the Clock. Point to Staff in the menu bar and click Add Staff. In the Add Staff pop-up window, add the staff member's first & last name and email address. Select the Location where the staff primarily works. It's okay if they work at more than one - just pick their main one. You'll immediately be directed to the Staff Summary page. You can choose to enter additional information for this staff member now, but this is not necessary while going through Getting Started set up. Learn more about the Staff record in our Help article for Staff/Instructors.